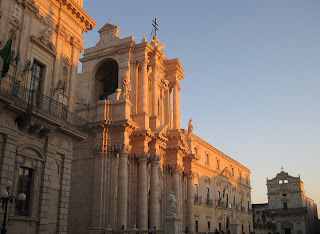 My last day in lovely Siracusa - or to be more clear, in strange Siracusa where I was fortunate enough to spend most of my time in lovely Ortigia - started very well, and remained so, for the most part. 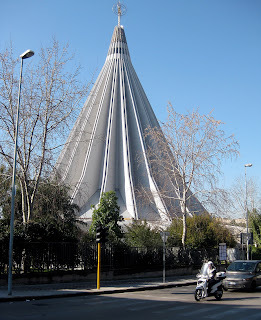 Santuario della Madonna delle Lachrime, built in 1994 to house a statue of the Virgin that was said to have wept for five days in 1953. 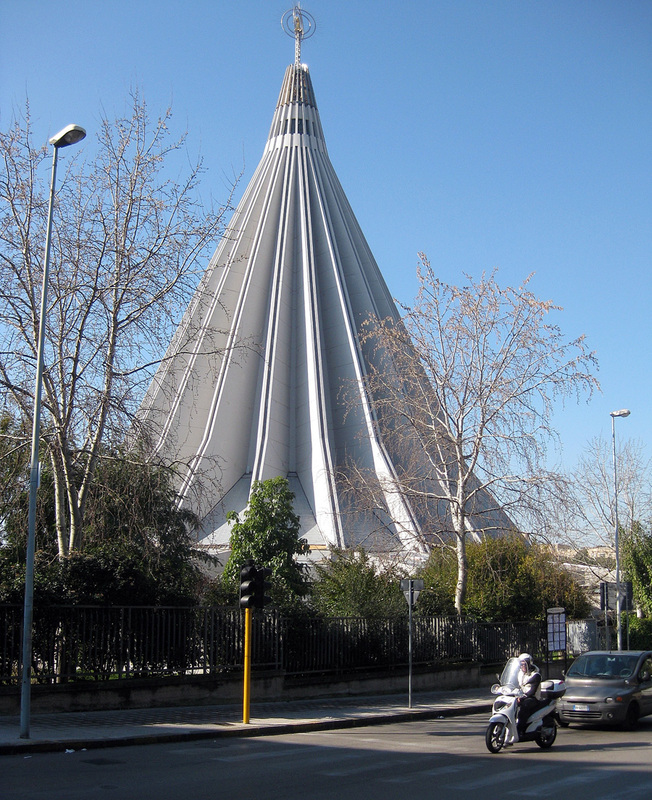 The church is supposed to resemble a giant teardrom, but to Dottore Gianni it looks like a Native American teepee of enormous size, or an umbrella not all the way open! 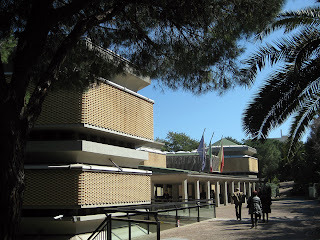 I decided that it would be better to see the Parco before looking through the museum and headed off in that direction, finding it more quickly and easily than I'd ever have thought. In fact it was much more difficult to find the box office for the parco, as it is located across a very busy road, and then not well marked. Once across the road you have to get past some very tacky tourist stands, and then off in the distance there's a building that can only be the box office, as that's all that's left in the area. Sure enough it was, I quickly bought a ticket, escaped the tourist stands, very carefully crossed the road and found myself in the Parco Archeologico. The first of several interesting sights in this park is the remains of the Anfiteatro Romano, or Roman amphitheatre, built in the third century AD. While there is not all that much of it left (no Colosseum this!) it is impressive, and carefully planned paths around it give you a good view from several different vantage points. One of its more interesting features is a small tank at its center, too small for aquatic spectacles, instead thought to have been a drain for all the blood spilt in the animal hunts and gladiator battles that were prime fare for such amphitheatres. I actually wandered into this area before buying my ticket, but the two attendants who were supposed to check for tickets were too busy jabbering to notice me. Who knows? If they'd been paying attention they might have been able to show Dottore Gianni how to get to the box office! 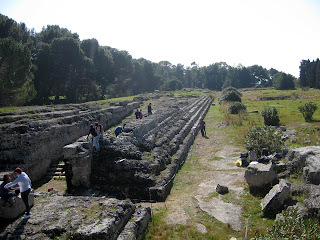 Next to the amphitheatre is located a site sealed off from the public, but where what looked to be a group of archeological students working the morning I visited, called the Ara di Ierone II. This is a gigantic altar, 200 meters in length, built in the late third century BC, the longest of any in all of Magna Graecia. Apparently for the annual celebration 450 bulls were led up ramps to the altar, to be slaughtered for the feast. The star attraction of the park is the very popular tourist spot the Teatro Greco. I spent a good bit of time walking around it. Not as large as the Theatre of Dionysos in Athens, it is an impressive sight. 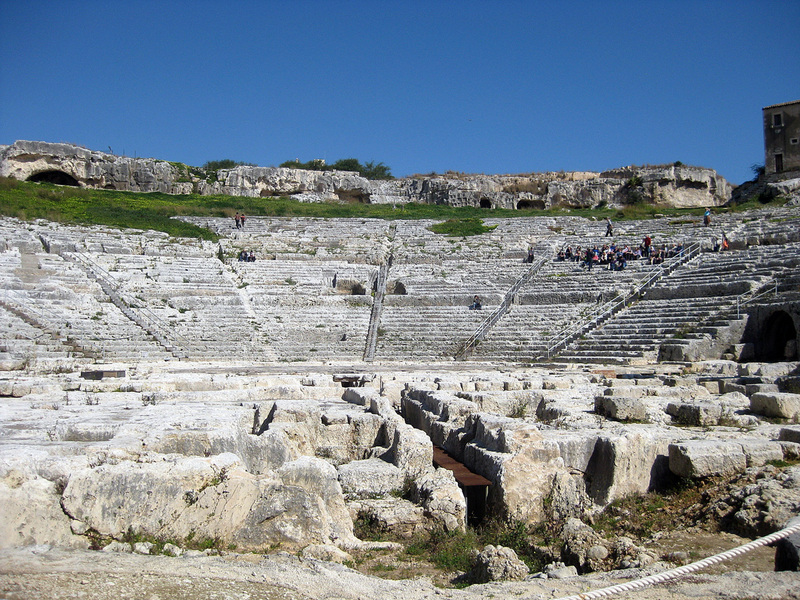 As I noted in the last post, Aeschylus came here to see his plays performed, The theatre that he saw would not have much resembled this, as there was no stone seating in the fifth century BC. This theatre would be more accurately called the Teatro Romano, as there is only a half circle orchestra (dancing space) and the remains of a large scaenae frons (a monumental wall backing the stage), whereas a classical Greek theatre had a full circle orchestra and a comparatively small skene (scene hut) hehind it, where the actors went to change costumes and wait for their next cue, etc. 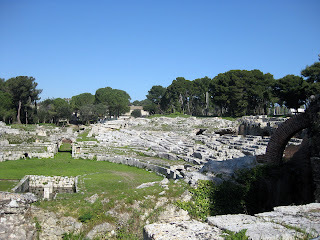 This newer theatre built on an older one was very common in the ancient world. 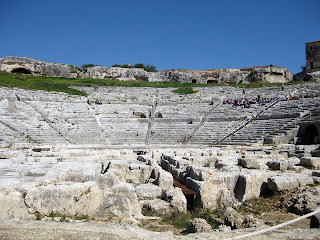 The theatre in nearby Taormina, which features and amazing amount of scaenae frons, is another example of a theatre known as the Teatro Greco, which is, in this theatre historian's view, a bit of a misnomer. After I'd had my fill of the theatre I wandered through the quarries, which are now grown over with lemon and orange trees, quite lovely. 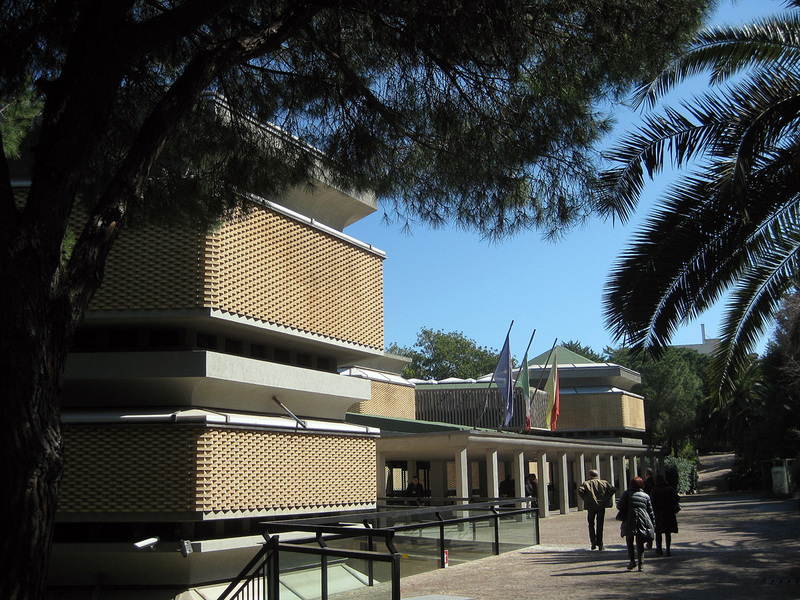 And then I left the Parco Archeologico, after a morning I considered very well-spent. but also offering some interesting material from further afield. It is divided into 4 sections. I had a good wander around the museum, but spent most of my time in section D, which focuse more on the Greeks and Romans than on earlier eras. There was a particularly lovely Venus in one room, and in another restorers were working on an object that had been found in the Teatro Greco. They were very friendly, happy I suppose to see an enthusiastic visitor. By the time I left it was nearing 1 pm, and I had packed a sandwich of excellent cheese from breakfast, so I sat in the park outside the museum and had a quick but pleasant lunch. I then made the trek back to Ortigia, rather easy and less time-consuming now that I knew my way, headed straight for the hotel and got some rest before heading out in search of the puppet theatre on the island. 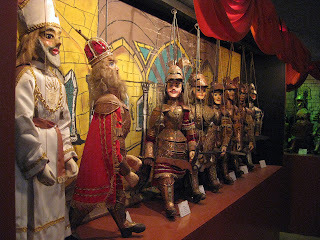 Pupi and the Laboratorio, where you can go in and watch the makers of the puppets at work, Alas no one was at the Laboratorio, and there were no shows scheduled at the theatre, but the Museo was open. I was the only visitor, and though it was tiny a lot was packed into it. 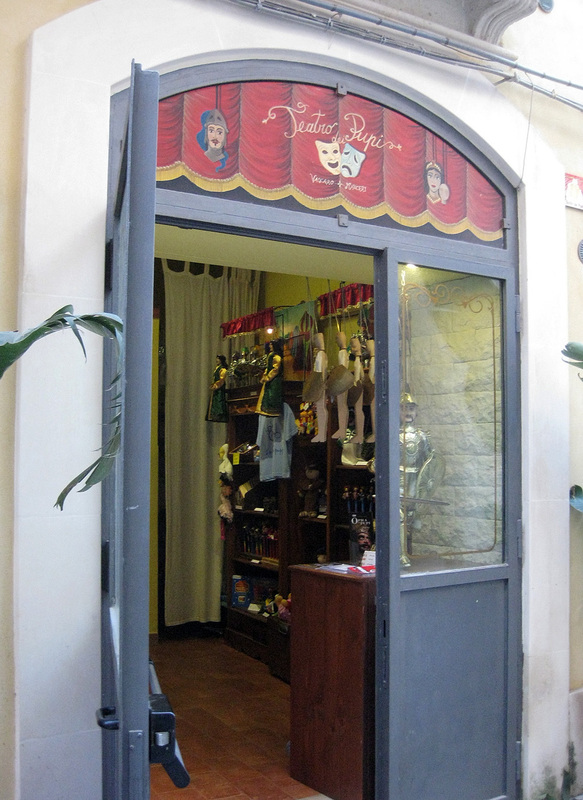 And then I had another wander, as I needed to buy oostcards, and ended in a shop/cafe that featured local treats. 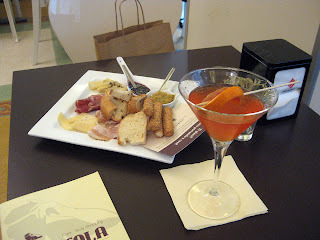 I decided on an aperitivo there, was given one similar to and every bit as delicious as the one I'd had the day before, and with it a plateful of local snacks, which I enjoyed while writing out the postcards I'd just bought in their shop. However! Having done just about all I'd planned to do in Siracusa, I was still early for dinner, my last dinner of my stay in that lovely city. So I strolled around a bit, catching on camera the last rays of the sun on the facade of the Duomo. And then I took myself back to the ristorante/pizzeria that I'd tried the night before. I was told rather sternly, "NO pizza!" Not sure what was going on with the pizza, but I said I just wanted food. That made them happy and I ordered swordfish, which was really mediocre -- but at least there wasn't much of it! However, before the main course I had tried an antipasta called caponata which was delicious. I may have to get the recipe and make it for myself...regularly! The best you could say for the restaurant, called the Luna Rossa, was its location. It was on that promenade near the Fonte Aretusa and even after sunset it was warm enough to sit outside and gaze out across the continually darkening bay. 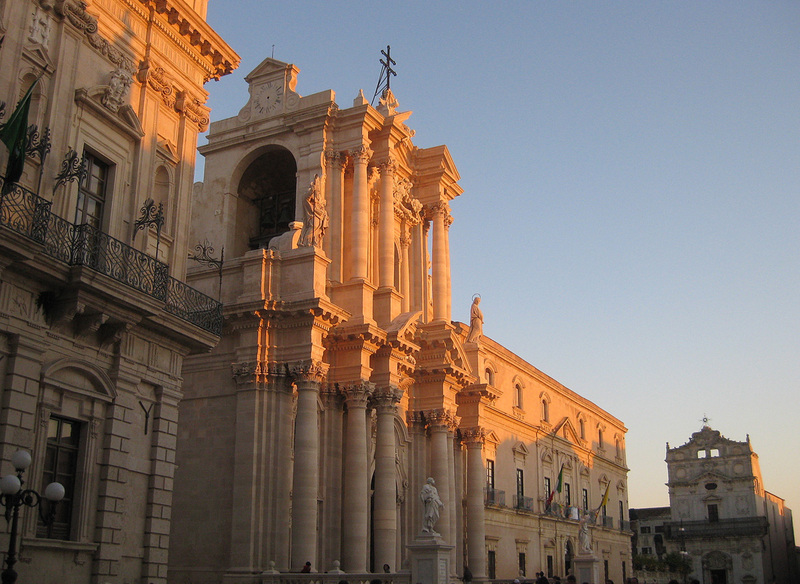 While not all the food was perfect, my last night in Siracusa was not all that bad. 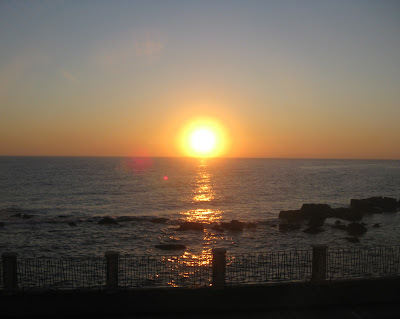 The next day, one last sunrise, one last breakfast, and I was on my way to the rail station to catch the train to Catania. 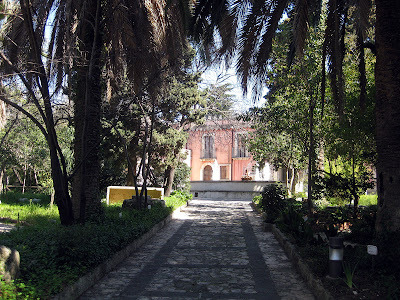 A bit about that rather different city in my last post about Sicily!